Basic 9: Black Forest Cake - Do You Know The Muffin Man? Next, Chef showed us how to slice the cake layers into three pieces. With the serrated saw knife, we relied on the teeth of the blade to do the work rather than pushing on the knife. Once the knife had cut into the cake, we rotated it slightly and continued to cut around, leaving the knife in the cake. After the outer edge of the cake had been partially cut, we sliced all the way through. The goal was to produce layers of uniform thickness. 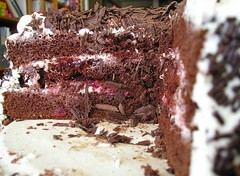 Since the cake was still warm, we put the layers into the walk-in and made chocolate shavings with a vegetable peeler. For the final assembly, we placed the bottom layer on a cardboard cake circle, then brushed it with a simple syrup flavoured with kirsch which another student brought in. We took the cream, combined it with whipped topping, and spread it almost to the edges. This was followed by cherry pie filling. Chef said he would never use this at work, rather, he would use frozen sour cherries and make the filling. Another layer of cake and cream and cherries and the top layer of cake. We masked the top and sides then coated the edge in chocolate sprinkles. The easy way to do this is to grab a handful and let it fall on the side of the cake. After piping a dozen rosettes on top, we filled the centre with the shavings, and put maraschino cherries on the rosettes. 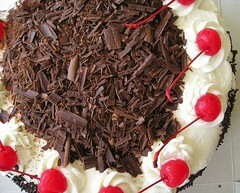 According to the German Wikipedia, Schwarzwälder Kirschtorte dates back to at least 1934. There are several stories about the origin: Chef said the dark cake layers are reminiscent of the trees in the forest and the snow covered tops are represented by the cream. When asked about the cherries, he said something about little men in red hats. I don't know what he meant either.